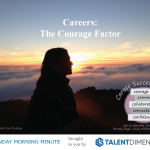 Are You a Talent-Focused Manager? In Predictions for 2017, Bersin identifies 20 key drivers for engagement which must be monitored and listened to for feedback to stay vigilant for problems. These 20 drivers are clearly highlighted in the international best-selling book by Dr. Beverly Kaye and Sharon Jordan-Evans, Love ‘Em or Lose ‘Em: Getting Good People to Stay. In the book, Kaye and Evans outline 26 strategies which, when applied by leaders with their employees inside organizations, support learning and growth, inspire loyalty to great managers and leadership, and create a work environment that people love. Leaders who use these strategies quickly emerge as Talent Focused Managers™ who are keeping employees engaged and satisfied in their jobs. 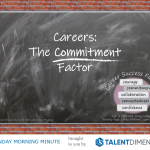 Are you a Talent Focused Manager™? Download and read a summary of our four focus areas and see where you are making the grade and where more work may be needed. After all, it isn’t enough for leaders to know about the key drivers, they must be able to identify them for each employee and be ready to do something about them.